It’s a common misconception that a hailstorm is solely a cold-weather event. Hailstorms are associated with severe thunderstorms and can occur any time throughout the year. Even though hailstorms are ice pellets, leading to the common misconception that they only happen in winter, these ice pellets are created high up inside the clouds where temperatures are below freezing. When hail finally drops from the clouds it can end up being anywhere between the size of a pea to as large as a grapefruit. The craziest thing about a hailstorm is how quickly they pass. In a matter of minutes, a hailstorm can form over an area and leave shortly after. In those minutes, though, a hailstorm can cause significant damage to you and your personal property. For this reason, it is important for you to know what to do should you get caught in a hailstorm while driving. In this particular situation, your vehicle will be your safe haven. 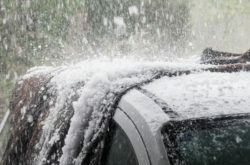 Heavy hail can do damage to your vehicle, so imagine the type of damage it can do to you if you step outside. You should remain in your vehicle and calmly pull off the road and park in a safe place. If you are fortunate enough, you can seek shelter under an overpass. If not, try to position your vehicle with your windshield facing the hail. Your vehicle’s windshield is stronger than other windows on your car and can hopefully withstand the impacts. You should then do your best to move away from your vehicle’s windows and instruct your passengers to do the same. Tell everyone in the vehicle to keep their faces covered as well. If you have children in your car, do your best to shield them from any potential broken glass. The next step is to simply wait out the hailstorm. Once it has passed you can step out of your vehicle and assess the damage. If you do not feel your vehicle should be driven then you should seek out roadside assistance. For any damages, you will most likely be looking at filing a claim with your insurance company. And while it is important to contact your insurance company as soon as possible, it is also important to consult an experienced attorney. The first place you should turn to for help with your claim is the Law Offices of Richard A. Stoloff. They will do their best to help you with your car trouble and make sure you do not get taken advantage of by an insurance agent. Richard A. Stoloff has more than 25 years of experience and has a strong track record of helping clients like you throughout New Jersey. All you have to do is pick up the phone and call his Linwood office at 609-601-2233 to begin discussing your legal options.